After over 10 years away from knitting and a hundred searches on the internet to find a suitable tutor, I stumbled on Aneeta's knitting lessons. I had never knitting anything substantial except for practising knitting and purling at school. 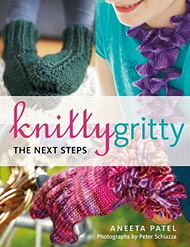 However, 10 years away from knitting meant that I had completely forgotten even those basic techniques. I found Aneeta extremely welcoming and friendly. Her style of teaching meant that it was easy to pick up the various techniques, resulting in me (similarly to the rest of the class) knitting a lovely red chunky knit scarf after a two hour lesson! This gave me loads of confidence to then knit a cardigan (with Aneeta's support), various other scarves and now I just finished a wonderful but intricate grey chunky knit rowan poncho (which I completed by myself). 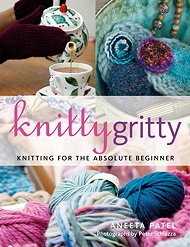 I would recommend Aneeta's lessons to anyone who wants a successful start to their knitting journey. London, knitting for 16 years. Although I have been knitting for a number of years I have never known how to pick up stitches correctly and this has really let down the look of my finished 'knits'. I went along to one of the drop in sessions where Aneeta was very helpful and friendly; with the mystery now solved my knitted pieces no longer have holes where they shouldn't!